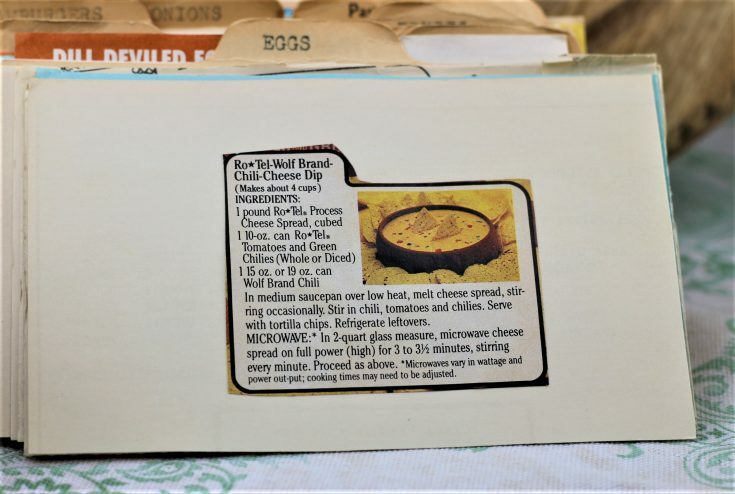 Front of the recipe card for Ro-Tel Wolf Brand Chili Cheese Dip. 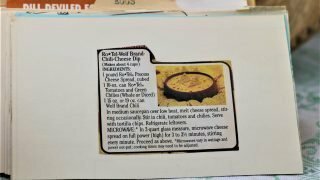 There are lots of fun recipes to read in the box this recipe for Ro-Tel Wolf Brand Chili Cheese Dip was with. Use the links below to view other recipes similar to this Ro-Tel Wolf Brand Chili Cheese Dip recipe. If you make this Ro-Tel Wolf Brand Chili Cheese Dip recipe, please share your photos and comments below! In medium saucepan over low heat, melt cheese spread, stirring occasionally. Stir in chili, tomatoes and chilies. MICROWAVE:* In 2-quart glass measure, microwave cheese spread on full power (high) for 3 to 3½ minutes, stirring every minute. Proceed as above. *Microwaves vary in wattage and power out-put; cooking times may need to be adjusted.